Recently the University of Gothenburg published a report about the researcher Finn Waagstein who introduced beta blocker treatment for heart failure in 1973. “Finn Waagstein was declared a reckless doctor and mocked by the international academic community. But instead of giving up he continued to promote his unusual theory of treating heart failure with beta blockers. He followed his heart and subsequently saved thousands of others. In time, he came to set a new standard for how to treat heart disease.” Looking to the introduction of beta blockers to treat pediatric heart failure by our group in 1996 , there are some similarities and differences that may explain the skepticism of pediatric cardiologist today. We shared a similar experience to Finn Waagstein with our disappointment treating patients with severe heart failure, because standard therapy was ineffective and the mortality remained unacceptably high. Regardless of the lack of acceptance by his peers, Finn Waagstein made the decision to initiate testing of beta-blockers in his clinic “It would not have been possible to do so today, but it’s important to understand how cardiac care looked in the mid-1970s. Mortality was almost 50 per cent. It was like a chamber of horrors.” In the late 1990s, most pediatric cardiologists believed the high mortality in infants with heart failure, due to univentricular hearts, was a local problem in some institutions and a consequence of a lack of experience. However, the US Pediatric Heart Network published research showing that mortality in infants with heart failure due to univentricular hearts was indeed very high . Today we know that the most impressive beta blocker effects on mortality are found in patients with severe heart failure. We published the first 6 infants with severe heart failure due to complex congenital heart defects treated with propranolol in 1998. There remained no doubt that this therapy will save infants lives. Unfortunately, this research was unrecognized, unsupported and remained unfunded. Without financial support, we have systematically investigated the autonomic nervous system in children with heart failure, short stature, attention deficit disorder, obesity and anorexia nervosa. Today, in adult cardiology, the efficacy of beta blockers in patients with congestive heart failure is universally recognized. They have had a high class recommendation in European and American guidelines for many years. Beta blockers, as a drug class, provide mortality benefits in comparison with placebo or standard treatment in patients with mild to severe heart failure , although large trials giving convincing evidence are available only for the beta-1-selective adrenergic receptor blockers Metoprolol succinate, Bisoprolol, and Nebivolol and the non-selective beta blocker Carvedilol. In contrast, 40 years after Waagstein's first reports  and 20 years after the first use in children , beta blockers are a long way from routine use in the clinic for pediatric heart failure. 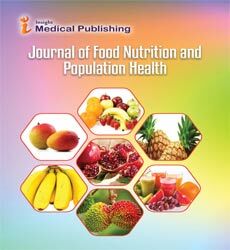 Research publications on the positive effects of the betablocker propranolol have encouraged pediatric dermatologists to use it in infants with heart failure due to hemangiomatosis and ophthalmologists in premature infants with retinopathy of prematurity [5,6]. These colleagues became followers of this new therapeutic approach. They investigated the effects of propranolol on vascular biology and neurodevelopment. Unfortunately, many pediatric cardiologists remain indifferent to these exciting developments and continue to treat their patients with digoxin and diuretics like 50 years ago. • Two thirds of children who die from heart failure are infants. • The main cause of childhood heart failure in Europe and the US are congenital heart defects (80% overall, 40% leftto- right shunts and 20% complex heart defects). • The main causes of childhood heart failure in the developing world are acquired heart failure due to anemia and infections. • Heart failure is one of the main causes of infant mortality worldwide. In 2006, we published data from 345 adults with congenital heart defects that showed a growing incidence of heart failure during follow up . Recently, 60 years of long-term data, for more than 10000 Scandinavian children with operated congenital heart defects , showed that 43% of these patients died from heart failure and 20% from sudden cardiac death. Added to this there were 21% fatal perioperative complications. Other problems, such as endocarditis, stroke, aortic dissection, bleeding, and embolism play a subordinate role in mortality. The mean age at death was 14 years, indicating that many patients whose cause of death was heart failure are children. Elevated brain natriuretic peptide levels are a surrogate parameter for heart failure and can be considered as a marker of prognosis in children  and adults with congenital heart disease [11,12]. Unfortunately, despite the fact that most of the children who died from heart failure in Europe and the US are infants with congenital heart defects, the main focus of heart failure research in pediatric cardiology has been in older children with ventricular dysfunction. It was Robert Shaddy who published the first cases of metoprolol treatment for children with cardiomyopathies . He initiated the US carvedilol trial , a multicenter prospective randomized trial with carvedilol in children older than 1 year suffering from heart failure from multiple etiologies. Unfortunately the US carvedilol trial in children and our BB-GUCH trial in young adults with congenital heart disease  recruited patients primarily with mild heart failure and low neurohormonal activity as indicated by low brain natriuretic peptide levels. Based on our current understanding of clinical trials, thousands of NYHA 2 patients, and very long-term observation times, would be required to detect a significant survival benefit. A feat which will probably never be possible in pediatric cardiology. Thus, it’s unreasonable to expect that an underpowered trial with very low dose carvedilol in 106 children with ventricular dysfunction with low BNP values should corroborate the results from more than 20000 adults with left ventricular dysfunction in well conducted prospective randomized trials . However, if we summarize all these underpowered trials with carvedilol in 228 children with left ventricular dysfunction in a meta-analysis, we find the expected survival benefit (OR 0.57; 0.33-0.97). In contrast to enalapril and digoxin, beta blockers improve clinical signs of heart failure and neurohormonal activation. The effect on mortality remains unclear in these small trials, but is similar to the 13% in the enalapril and placebo group of the US trial. For this trial, 230 of 533 infants from the Single Ventricle Reconstruction Trial were recruited, and 31 died. The overall one year mortality of 555 subjects with a single right ventricle was higher (30%). Indeed children are not miniature adults, but they are unique individuals. Perhaps for the first time in medical history pediatricians are calling for a life-saving therapy for children to be used only before appropriate child studies are carried out. 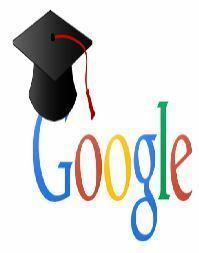 It shows a degree of cynicism if such studies have not been carried out for more than 20 years. As shown in Figure 1, there is a steep increase of publications after Finn Waagstein’s publication about beta blockers in heart failure, and after Christine Leaute-Labreze’s publication about propranolol in infantile hemangiomas, but not after the first successful therapies with propranolol in infant’s heart failure, the group with highest mortality. Only 4 prospective randomized trials in infants with heart failure due to congenital heart defects were found, three of which are investigator initiated trials. Figure 1: Publications/year/indication of beta blockers in children and adults. 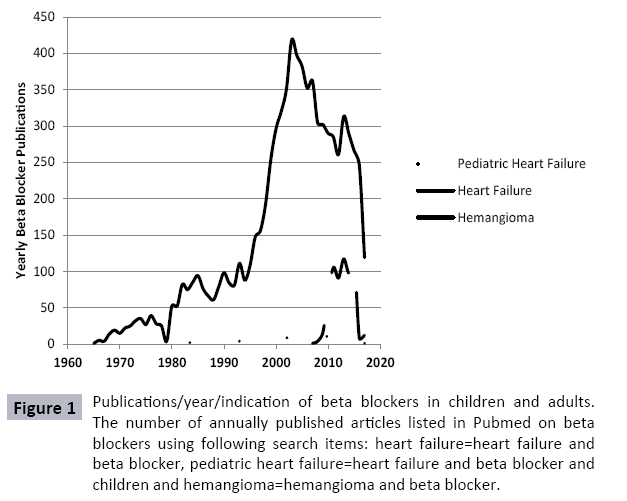 The number of annually published articles listed in Pubmed on beta blockers using following search items: heart failure=heart failure and beta blocker, pediatric heart failure=heart failure and beta blocker and children and hemangioma=hemangioma and beta blocker. There are some minor indications of beta blockers in childhood heart failure proven by small research groups in Sweden and Japan. Ingegerd Östmann-Smith showed a survival benefit in children with hypertrophic cardiomyopathy treated with high dose propranolol. Japanese children with Duchenne cardiomyopathies, treated by adult cardiologists, were probably the first children with heart failure who are treated with a beta blocker. It is unclear what the current practice in childhood heart failure is. Beta blockers were introduced in the German guidelines in 2006 and in the Canadian guidelines in 2013. It is certain that preoperative beta blocker treatment remains highly controversial, but we are surprised to see that more and more pediatric cardiologists routinely use beta blockers despite criticism from opinion leaders. However, published data from the US show that infants with a single ventricle are treated with diuretics (90%), ACE inhibitors (38%) and Digoxin (28%). Only 4.2% of these infants received propranolol. For left ventricular dysfunction “National Prescribing Trends for Heart Failure Medications in Children“ showed an increase in the use of beta blockers from 10% in 2001 to 40% in 2005, but no further increase up to 2010 after publication of the US carvedilol trial. Today, only 35.9% of children with heart failure receive a beta blocker at admission. From 13892 pediatric heart failure hospitalizations in the US, 1014 children died (7,3%). The mortality rate in pediatric patients with heart failure is nearly twice as high as in adults. This could be due to more frequent use of beta blocker in adults which led to 40% mortality reduction. The potential of saving 400 children's lives in the US alone should be an order to the opinion leaders in pediatric cardiology to rethink their “nihilism” towards administrating beta blockers in pediatric heart failure. In 2003 the first infant with heart failure due to liver hemangiomatosis with propranolol was treated in our clinic. We observed the clinical improvement of heart failure, but did not have the opportunity to observe the regression of hemangioma because the baby died after an interventional treatment for liver hemangioma. Five years later, C. Leaute-Labreze – a pediatric dermatologists –observed the regression of a cutaneous hemangioma in a child who was treated with propranolol for cardiomyopathy . After the publication of the first eleven cases in the New England Journal of Medicine, propranolol treatment of hemangioma became the treatment of choice within only 5 years and stimulated intensive research into this topic (Figure 1). Pediatric dermatologists understand the beneficial effects of propranolol, not only for cosmetics but also for life threatening conditions like heart failure and prematurity. Investigators are currently studying the impact of propranolol on the autonomic nervous system, endothelial function and neurodevelopment. Today, we know that propranolol improves vagal maturation and is not associated with psychological problems at 7 years of age. All these effects of propranolol on vascular endothelial growth factor, endothelial nitric oxide synthase and neurodevelopment observed in these studies may be very important for patients with congenital heart disease. To explain the beneficial effects of beta blockers in pediatric heart failure, it seemed appropriate to transfer the popular neurohormonal heart failure model to children’s pathophysiology. However, there are important differences between heart failure due to left ventricular dysfunction and heart failure without left ventricular dysfunction in children with congenital heart disease. Within the last 20 years we observed a consistent clinical pattern while up titrating beta blockers in patients with severe heart failure. We observed that the clinical improvements with propranolol in infants with congenital heart disease occur within the first week of treatment and the target dose is reached by the third week. Up titration in children with cardiomyopathies requires a longer time, which is much more dangerous due to the resultant clinical impairment while starting very low dosages of carvedilol or metoprolol. Of note, is that after reaching the target dose, we no longer require diuretics in children with congenital heart disease, but further diuretic treatment is required in most children with cardiomyopathies. What is the pathophysiological reason for these differences? In 1995 we had developed a pathophysiological model to explain the therapeutic effect of propranolol on effusions in children with single ventricle after the Fontan procedure. The mechanism involved appeared to be an increased mean capillary filtration pressure, calculated from hemodynamic data based on Starling’s theories of ultrafiltration in the capillaries that may be reduced by the vasoconstrictive properties of propranolol. Our observation was confirmed by well published clinical cases in children with effusions. In the following years several new indications of propranolol were found and all seem to be related to its vascular effects: Hemangioma-Lymphatic Anomalies-Retinopathy of Prematurity-Refeeding edema. If all these children have no myocardial damage, the afterload increase due to propranolol induced vasoconstriction is not related to a hemodynamic impairment, in contrast to patients with cardiomyopathies. Shear stress induced expression of endothelial nitric oxide synthase is caused by increased pulmonary blood flow, as shown in an animal model, and in infants with left to right shunts. Plasma nitric oxide products are related to high pulmonary pressure and low cardiac index in infants with congenital heart disease. Propranolol has been shown to have a beneficial effect on endogenous nitric oxide and soluble tumor necrosis factor receptors in this patient group. This possibility is supported by the observation that oral propranolol induces a significant decrease in endothelial nitric oxide synthase and vascular endothelial growth factor levels in children with proliferating hemangiomasimportant factors for the development of pulmonary vascular disease in congenital heart disease. All these observations are very important for the pathophysiology of pulmonary hypertension in children with congenital heart disease, the so called Eisenmenger syndrome. The concept to treat pulmonary hypertension with propranolol, as published in 1999, is now supported by beneficial effects of beta blockers in patients with pulmonary hypertension and a better understanding of the underlying mechanisms. The beta-adrenergic receptor has become an important therapeutic target in pulmonary arterial hypertension and pulmonary artery denervation currently revolutionizes pulmonary hypertension treatment. In 2015 we published a model called “autonomic imprinting” that offers an explanation on how early life stress impairs growth and cognition, and increases cardiovascular risk in later life. Heart failure was only one of the different causes of early life stress, which include intrauterine growth retardation, prematurity and maternal stress. Our research also led us to begin to understand the impact of nutrition on the autonomic nervous system. 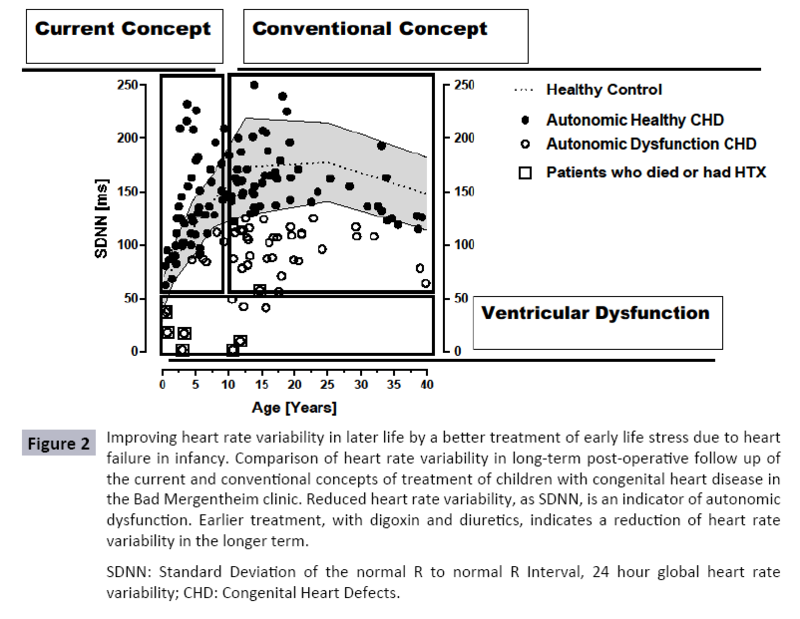 Today, we are able to demonstrate that the concept to prevent and treat early life stress in children with congenital heart defects has longtime beneficial effects on the autonomic nervous system as measured by 24 hour heart rate variability (Figure 2). As a result of this research, the concept to treat heart failure had evolved. So, in 2004, changes to heart failure treatment were implemented in the Bad Mergentheim clinic. The goal was to improve autonomic imprinting by heart failure with the use of propranolol without any use of diuretics in infants with heart failure due to congenital heart defects. This current concept group, with an age up to 12 years, is the first complete published group with operated congenital heart disease who had supernormal heart rate variability and obviously no autonomic dysfunction. Nearly 50% of our conventional treated patients, with an age between 13 and 40 years, have low heart rate variability and in part severe autonomic dysfunction as published by other groups. Figure 2: Improving heart rate variability in later life by a better treatment of early life stress due to heart failure in infancy. Comparison of heart rate variability in long-term post-operative follow up of the current and conventional concepts of treatment of children with congenital heart disease in the Bad Mergentheim clinic. Reduced heart rate variability, as SDNN, is an indicator of autonomic dysfunction. Earlier treatment, with digoxin and diuretics, indicates a reduction of heart rate variability in the longer term. The efficacy of beta blockers for the treatment of adult heart failure is well established. There are currently no guidelines for the use of beta blockers, such as propranolol, to treat heart failure in children with congenital heart disease. However, while there is currently significant supporting evidence for the clinical use of beta blockers to treat children with heart failure, it is not current practice. Propranolol is currently being used to treat hemangiomas and retinopathies in infants and research has demonstrated its profound effects on the vasculature, including the activity of endothelial nitric oxide synthase and vascular endothelial growth factor. Hopefully this recent work inspires pediatric cardiologists to embrace further clinical studies for the use of beta blockers for treatment of heart failure in children with congenital heart disease. Buchhorn R, Bartmus D, Siekmeyer W (1998) Beta-blocker therapy of severe congestive heart failure in infants with left to right shunts. Am J Cardiol 81:1366-1368. Ohye RG, Schonbeck JV, Eghtesady P (2012) Cause, timing, and location of death in the Single Ventricle Reconstruction trial. J Thorac Cardiovasc Surg 144: 907-914. Chatterjee S, Biondi-Zoccai G, Abbate A (2013) Benefits of beta blockers in patients with heart failure and reduced ejection fraction: network meta-analysis. BMJ 346: f55. Waagstein F, Hjalmarson A, Varnauskas E (1975) Effect of chronic beta-adrenergic receptor blockade in congestive cardiomyopathy. Br Heart J 37: 1022-1036. Leaute-Labreze C, Dumas dlR, Hubiche T (2008) Propranolol for severe hemangiomas of infancy. N Engl J Med 358: 2649-2651. Filippi L, Dal Monte M, Casini G (2015) Infantile hemangiomas, retinopathy of prematurity and cancer: a common pathogenetic role of the beta-adrenergic system. Med Res Rev 35: 619-652. Schmaltz AA (2015)Chronic congestive heart failure in infancy and childhood: new aspects of diagnosis and treatment. Klin Padiatr 227: 3-9. Norozi K, Wessel A, Alpers V (2006) Incidence and risk distribution of heart failure in adolescents and adults with congenital heart disease after cardiac surgery. Am J Cardiol 97: 1238-1243. Raissadati A, Nieminen H, Haukka J (2016) Late Causes of Death After Pediatric Cardiac Surgery: A 60-Year Population-Based Study. J Am Coll Cardiol 68: 487-498. Inuzuka R, Tatebe S, Wakiguchi S (2012) B-type natriuretic peptide at the early stage of univentricular circulation reflects inadequate adaptation to volume overload. Int J Cardiol 159: 88-93. Miyamoto K, Takeuchi D, Inai K (2016) Prognostic value of multiple biomarkers for cardiovascular mortality in adult congenital heart disease: comparisons of single-/two-ventricle physiology, and systemic morphologically right/left ventricles. Heart Vessels 31: 1834-1847. Videbaek J, Laursen HB, Olsen M (2016) A Long-Term Nationwide Follow-Up Study of Simple Congenital Heart Disease Diagnosed in Otherwise Healthy Children. Circulation 133: 474-83. Shaddy RE, Olsen SL, Bristow MR (1995) Efficacy and safety of metoprolol in the treatment of doxorubicin-induced cardiomyopathy in pediatric patients. Am Heart J 129: 197-199. Shaddy RE, Boucek MM, Hsu DT (2007) Carvedilol for children and adolescents with heart failure: a randomized controlled trial. JAMA 298: 1171-1179. Norozi K, Bahlmann J, Raab B (2007) A prospective, randomized, double-blind, placebo controlled trial of beta-blockade in patients who have undergone surgical correction of tetralogy of Fallot. Cardiol Young17: 372-379.